Best of 2010 Giveaways Still Going On: CARA B NATURALLY! « LUXETIPS! | Every Woman Deserves To Live The Luxe Life! Best of 2010 Giveaways Still Going On: CARA B NATURALLY! How was your Christmas? I hope very Merry and filled with love! The luxe kids and I made Christmas cookies and cuddled on the couch in the glow of the Christmas tree listening to Mariah Carey’s original Merry Christmas album. It was actually magical. God is good! Well we only have a few days left of 2010 and the Luxetips Best of 2010! giveaways are not done. Next up is Cara B Naturally. 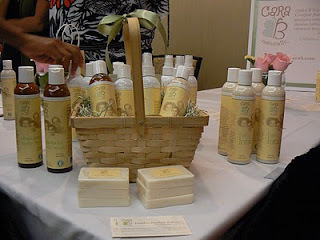 Remember how I raved about this new all natural hair and skin care line for ethnically diverse children? Well I am a believer in the brand and I love it for luxe baby. The products smell good; are gentle to her skin, and the shampoo and conditioner do a pretty good job with her hair. But this line also includes body lotions, bar soaps, and bath washes. In fact, one lucky Luxetips reader will win an entire gift basket chocked full of Cara B Naturally products. The gift basket includes: shampoo/body wash, conditioner, hair mist, bar soap, and lotion. Divas if you have kids and are looking for line that is good for your children and the environment, Cara B Naturally is perfect. The products are free of parabens, petrolatum, phthalates, sulfates, mineral oil, artifical fragrances and preservatives. Enter by leaving a comment on this blog by midnight December 28, 2010. A winner will be chosen via random.org. Good luck! I have a little girl and I’m always looking for safe product for her. Cute and cool website! Thank you!